Forward thinkers understand content is still king and focus on such while deploying minimal upgrades, rather than relying on skillful makeovers that gain short-lived traffic spurts following award listings but offer downright weak content. How wrong I was. Apparently the Incessant Redesign is far from extinction. 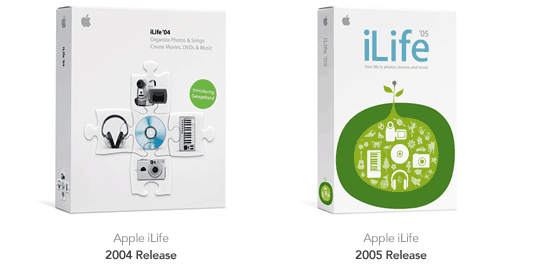 Virtually absent from the discussion was any mention of the rebranded iLife packaging. With little fanfare, Apple introduced a refreshed identity—let’s call it a “redesign” for now—for its suite of lifestyle tools, and an unexpected hush seemed to fall over the crowds that might have otherwise discussed the shift in packaging design. It was almost immediately following the release of iLife ’05 that the idea for this article was spawned. Something clicked. The new iLife packaging wasn’t just a redesign for the sake of redesigning. It seemed to represent much more than that. Personal computing was no longer something done to accomplish something else more efficiently, but rather a part of everyday life, even critical to communication and social interaction. The iPod, for example, was no longer only for the technorati; it was quickly becoming mainstream for coder and soccer mom alike. And that’s what the new packaging seemed to portray—less about technology, more about people. The camera, keyboard, and similar objects subtly remain from the previous packaging, but the organic styling and seed metaphor—a perfect representation of “life” itself—steal the show. So was the new iLife packaging merely another redesign to satisfy creative hunger pangs, or was it an attempt at something greater? Perhaps it wasn’t even a redesign after all, but rather a shift in positioning—a realign instead of a redesign. By now it’s apparent that I’ve split us, the creatives, into two camps—and equally apparent that I prefer to wear Realigner team colors. Allow me to indulge in team bias by comparing the two. It’s been 2 years since our last redesign. Our current stuff just looks old. A redesign would bring new traffic to the site. Too often, look and feel, color scheme, layout, and identity are presented as solutions to problems discussed in these conversations long before regard is given to other less-aesthetic issues that may very well be the root of the problem. The old warning against treating symptom rather than cause comes to mind. Our current website does little to convey the strength of our product offering. Does our online presence enhance or devalue our overall brand perception? Perhaps the best way to educate one’s self in the whys of realigning is to start by saying no. Strategy is often just as much about saying no as it is about saying yes. So is realigning. Thank you, Godfather Michael. You’ve given us reason to question redesigning and begin thinking about realigning, simply by first saying no to the typical whims of gratuitous refresh and renew. But enough about strategy and other conceptual banter. Let’s talk practical application. So who’s already riding the Realigner bandwagon? A few brief case studies follow. Though we’ve never met in person, I consider Jesse Bennett-Chamberlain one of my closest friends. While authoring initial ideas for this article, I was given a peek at the upcoming redesign—er, realign—of Jesse’s studio site, 31Three. Jesse had no idea I was penning thoughts on this subject, yet the instant I saw his nascent layout in raw format I knew I had my first case study. After literally years of begging him to do so, Jesse was finally heeding the call to jump from tables to standards, as well as adding a blog to the site. Accordingly, the site needed to be updated, yet an all-out redesign wasn’t necessary. He already had a solid design, so following a few minor color, grid, and typography changes he was well on his way to becoming a Realigner. Gorgeous, isn’t it? Final score: Realigners 1, Redesigners 0. Notice any sweeping changes from year to year? Neither did I. Dan has managed to tune, tweak, and adapt his site in response to growth and changes in positioning, while maintaining a skeleton that bears similarities with each passing phase. As I’ve watched Dan launch new versions over the years, he’s done so with an eye toward purpose-driven improvements. Chalk up another one for the Realigners. Not so fast, honey. Keep reading. Over the summer, I had the pleasure of doing contract work for March of Dimes. Founded by Franklin D. Roosevelt in 1938, March of Dimes seeks to reduce premature births through research and fundraiser events such as WalkAmerica. Following a generous referral from Nick Finck, they came to me in need of a new homepage. 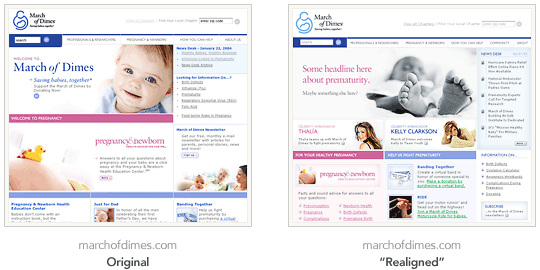 In September of 2002 we launched our parent website, www.marchofdimes.com. Since then, we’ve built several other websites, our page views have grown exponentially, we’ve built an online fundraising tool from the ground up that raised over $12 million this year, and gained tremendous credibility and interest from within the foundation itself… To support all of these initiatives and continue our growth into other online communities (message boards and blogs), we need to re-address and redesign our homepage. Bingo. They nailed it. That’s the thinking of a Realigner—purpose-driven retooling. There’s virtually no mention of aesthetics, but plenty of talk about responding to growth and new opportunities. And so began the realignment of the March of Dimes homepage. In fact, we were to realign only the homepage; all other pages would remain intact. The homepage, therefore, would not only need to address the issues mentioned in the RFP, but it would also need to integrate aesthetically with the rest of the site. This fact alone silenced any desire for a full makeover. It’s probably no surprise, then, that the realigned homepage (shown at right above) will not be entirely different from the existing homepage. The new homepage is scheduled to be released in the coming weeks and is still under final review at time of publication (note the filler headline, for example). By now I hope I’ve recruited you to join me on the Realigner sidelines. However, be aware that I don’t shun the full refresh in all its aesthetical glory when necessary. It’s perfectly fine to refresh the entire design from the ground up if there’s good reason to do so, and especially if it’s the cause and not merely the symptom of your site’s woes. In fact, this very site (A List Apart) underwent a similar transformation only weeks ago, based on a need to adapt to the new identity, brand extensions (A Book Apart, An Event Apart), and other necessary improvements. So by all means, bring on the full refresh should it be warranted. Ensure a “raison d’être” exists. What are the reasons/objectives/purpose for realigning? I typically reserve a line in my clients’ project summaries specifically for this item, What is the raison d’être for this project? Remember to say no just as much as you say yes. Greg Storey’s ALA foray on a similar topic is worth a read: “Never Get Involved in a Land War in Asia (or Build a Website for No Reason)”. Determine what level of realignment is required. Will minimal changes suffice, or is a total revamp necessary? A solid raison d’être will aid in answering this question. Evaluate user switching costs. What will the impact be to users of the site? How will they be forced, enticed, or encouraged to mentally “switch” to the realigned design and any changes to the user interface, navigation, color scheme, etc.? How painful or painless will the switch be? Will this affect the level of realignment required? Determine the impact on launch plans. Answers to steps 2 and 3 will set the stage for launch and will likely determine such issues as whether a phased rollout or a single deployment is necessary. Go get ’em, kids. As Mom used to say, “make something of yourself.” Team Realigner is a great place to start. Cameron Moll is a freelance new media designer, with a passion for functional web design, clean markup, and savvy print design. Some say this one-page PDF sums things up quite nicely. Others say his website does the trick. I agree that often elements of a site’s design only need to be adjusted – not thrown out entirely. I risk sounding cliche, but it is important not to throw the baby out with the bath water . However, I don’t think the term “redesign” has to entail destroying the old look of a site in favor of a new one. A redesign can also mean evolving a current design to fit the needs of a site better. redesign: To make a revision in the appearance or function of. Revising doesn’t mean destroying and starting anew. Redesigning, in my mind entails just what your “realigning” term means – adjusting and revising. But sometimes those revisions need to be radical to fit a changed need. In fact, I would call all three of the examples you cited as re-designs, especially your first example, 31three. I think the word “design”, when applied to web sites, means more than it’s appearance, but refers to the entire user experience and site structure. I would call a shift from hacked tables to web standards a radical redesign, even if the visual look remained mostly the same. I really don’t have a problem whatsoever with the incessant redesigning going on these days, and I especially don’t think you have to choose between developing good content or redesigning a site. I think there are bigger problems in this industry than incessant redesigns, and maybe they need some new terms coined. For instance, incessant re-branding, incessant SEO bull, incessant blabbering of buzzwords/ coined terms, incessant “coming soon” hype pages (hey, I’m guilty too), etc. Redesign and realignment aren’t mutually exclusive camps – why should this be an either/or thing? I personally got a lot from this article – I’m new to the whole 2.0 ‘movement’ (note the virgin blog) but not to redesigns… for years it’s been ‘my scientific speciality’. I’m currently responsible for a massive redesign of a regional news portal in my area and defining a line between aesthetics and function within the redesign seems to help me wrap my head around the whole thing. Whereas a makeover is definitely in order, a complete aesthetic shift isn’t possible – we need to match the feel of the print publications we support – and a should be thinking more like ‘how can I adjust the current vision to more effectively execute the function’. Great article. I always appreciate Cameron’s articles. I don’t think Cameron is really trying to sub-divide designers into two categories, but rather trying to make those designers who crave redesign (hey, it’s our job AND our passion, right?) to make sure that they have good reason to fufill that craving, or to resist it. This is a good reminder that all sites don’t need a total redesign. Back in their client days, 37signals did this through their 37express 1 page redesigns, but if you look at the example it is more of a realign. I agree with Jason that Cameron wasn’t trying to intentionally force designers into one of two camps, but rather using hyperbole somewhat to get his point across. I believe there is a lot of similarities to what Cameron calls “redesigners” and “realigners.” The “redesigners” usually don’t go far enough in their thinking and reasons for redesigning. Its a good reminder for us to think though why we redesign. While still in school, a designer once told me “whatever you do design-wise, make sure it has a point.” Never forgot it. What do bad designers do? It is supposed they won’t do either, I guess. When we think of realigning, it always makes me feel that it’s the good strategy for a company of gregarious sheep, who follow the stream but do nothing to determine its course. Realign realign, hurry up we must reALIGN with the LINE they have given to us. There can be no leadership in the net (even if just for the Warhol canonical 15 minutes) if design is not meant to lead, but to REALIGN, to COMPLY (with w3c often, taking their specifications as pure gold even when they are clearly absurd – for we all know that whatever the w3c says is perfect), and to FOLLOW. Are we raising a generation of followers? In this fashion we produce sites all too often looking like each other provided they have to cope with the same market field (think of some PHP websites: since they feel they are in the same lot, they also feel they must imitate each other’s design in order to compete better). Not only, but we are all under the spell that designing websites is for the market. It can’t be for the Art. It must be for the BUCKS. It is given as a granted fact, invariably. The consequence that is entailed is that we are implicitly BUILDING EXPECTATIONS in the surfers. These expectations are all levelled low to the designs that become more successful and therefore more familiar and more browsed. The immdeiate consequence is that as soon as a surfer sees something that does not comply with the reALIGNED designs, there we go that is immediately seen as “ugly”. Gestalt studies and cognitive dissonance might come in handy. Could we teach our surfers and our designers too not just to REALIGN like sheep but also to VIOLATE like artists, rather than stirring endlessly the same old sauce in the same old pot? Double whammy Cameron. First your’s then the referral. Michael Porter’s article is bang on. The iLife redesign was clearly to SELL MORE BOXES. Comparing the two, one has a title way too small to spot (the other way too big, but at least it’s readable). One has a bunch of average jigsaw pieces on it, the other has a bright, cheerful green shape, guaranteed to catch the eye. Now websites often don’t have to follow Apple’s hard sales technique. 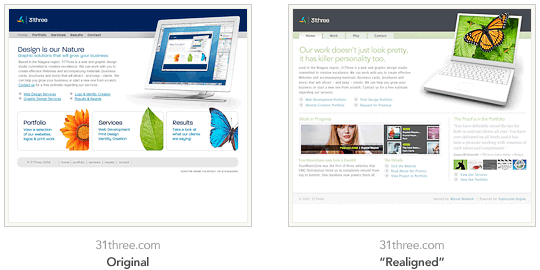 Personal sites can look exactly how they want. Of course they’ll grab more visitors if they look dandy rather than dull. Business sites must always look fresh to incite sales, so I guess they feel they MUST redesign (or realign) every year, if not sooner. I have to be wary of this now though. My site has had so many redesigns (catalogued on the Past Layouts page) but still I itch to redesign it all again! Instead I tweak the layout to fit the content better and add new sections. Until the backend changes radically, there’s no point doing more just yet. Also, I go through much tearing out of hair in frustration at browser bugs when redesigning, so another reason to avoid it! Great article anyway. I would better it by making the animated gif controllable by the user. I want to view the first image in the animation longer, but I can’t. Could you make it so you had to click to see the next frame? Or have links at the base to each frame like a slideshow. Allow the user to choose which frame they wish to see, and in which order, at any time. So, they now use tables, have a blog and a new redesign. You don’t mention how any of this realigns anything. The constraints of this article didn’t exactly allow me to exhaustively explain each of the three case studies. I could have devoted more time to describing 31Three, as Stan suggests, but I felt a brief explanation was sufficient in light of the other two case studies. Long story short, I considered 31Three a realignment because it a) built on the previous structure and design, while b) “aligning” the studio with web standards and blogging. It was far from a redesign simply for the sake of new paint. You can blame me for Cameron’s short overview of my site. He sent over some questions that I was supposed to get back to him regarding why I redesigned realigned my site… but in the flurry of getting the site done, I failed to respond. My previous site.. which is at http://www.31three.com/oldsite was difficult to update so it got stale pretty quickly. The front page was always the exact same and the site was generally fairly “dead”. I wanted to change around the front page to add some elements that I could update from time to time as well as add a blog so that I could keep the site looking alive. Now that the site is easy to update, I have no excuses. Many billion dollar companies use to redesign their sites when their stock values lowered and a new CEO came on board. Many of them have realized that listening to what the customer wants or needs is more important than a total “redesign”. Create better content, and make it pleasing and easy for the visitor (i.e. customer). Good job Cam – that’s why the large companies approach you for business! And let’s not forget that any change to a website – especially to the homepage – will disorientate and confuse its users … and therefore its customers. HSBC went through a phase of redesigning their home page very frequently, so that for about 4 months, every other time I tried to access my bank details, the button to log in was in a different place, looked different or had a different name. This sort of issue ought to be picked up in a realignment, but in the more serious case of a redesign, the usual policy seems to be to change the look of everything completely – which is *not* good if you have a regular customer base. That’s a good sensible article, but I’m not sure why we need to introduce the term “realign”…. It sounds good to say “don’t re-design, re-align!”, but isn’t this basically re-development? I personally think the article presented an extremely valid point. I’ve never really thought of this before, but now I’m starting to question the proposed redesign of my company website. I have to wonder if it’s in need of the proposed rebranding and redesign, or if it simply needs to be realigned. Either way, great article Mr. Moll. I just recently got into using web standards when designing web pages, so I had never really seen the older versions of SimpleBits. It’s pretty amazing how many times a website can be realigned, yet still maintain the creativity that made it popular. I do have one question about this whole situation. Say you created a new logo for your website, is that something deserving of a complete redesign, or just a realignment? bq. Say you created a new logo for your website, is that something deserving of a complete redesign, or just a realignment? If it’s a new logo for the whole company/organisation, that is a major rebranding. It might merit a redesign of the site if it is significantly different in style or colour from the old one, or it might fit fine with the same design. If it’s just a new logo for the website, ask yourself ‘why?’ – this is the kind of rebranding and redesigning that doesn’t help anyone, just creates work for people and a warm glow as they appreciate their own artwork. I don’t see either of these as being suitable candidates for ‘realignment’ – you are not changing anything structural or significant – only the face of it. It might be major – a full-blown redesign – or it might be minor – a “tweak” – but unless you’re doing something more with it, I don’t think you could call it a realignment. But I don’t know if I’m using the words in quite the same way as the author! For those concerned about adding yet another buzzword (“realign”) to the creative’s vocabulary, know that wasn’t my intent. Rather, the term served as a good descriptor of the difference between new paint and strategic alignment. I don’t necessarily expect the creative community to begin using the term moving forward, but I do hope we think differently about the approach moving forward. But you still have to have the underlying statement of purpose. I know there are subtle differences between realigning a project and just patching it. I’ve always said it’s not that the customer is always right, it’s their needs that are always right. A realignment as the author suggests is in many ways a stop gap to redesign. It is not a bad thing but one people should have in their minds when working with a client. You realign when the focus may have been lost yet the content is still viable. You realign when focus is there but the content (or presentation thereof) is not at quality standards. A redesign is when standards or strategy are no longer reflected on the page. I wished the realignment of the March of Dimes pages were Section 508 compliant, though. With all those graphics and action buttons, none were marked with alternative text. Home Page Reader (for visually impaired) barfed on that site. Interesting. I would point back to Adam Greenfield’s article and the idea of a designer vs a stylist. (http://www.alistapart.com/articles/bathingape/) If we compare the two ideas, your redesigner is Adam’s stylist and your realigner is Adam’s designer. A designer/realigner is trying to solve a perceived problem. Where as a redesigner/stylist is trying to improve the established aesthetic. By the way, Adam’s article was written in 2001. Purpose is definitely the driving force of innovation, but “realigning” is not the only solution that satisfies the marketing needs of a businesses’ web site. Before jumping head first into the realign mindset, realize that realigns and redesigns are equal, and both afford different purposes. A “realign” can add emphasis to features of a web site with growing popularity. However, to attract a new market or to “water” a growing market, a redesign of a web site can appeal to the people you mean to have as new or growing customers. Personally, I was trained in web development, not web design, so for me it takes several iterations to come up with something tollerable. I think this is a problem with a lot of sites being redesigned on a regular basis. If I’m not confident in my design, I’m not as willing to show off my site. A large number of sites just don’t cut it and require more than a “realign”. I believe this boils down to something even simpler. Pure Functionalists: These people generally are the hard coders and project managers. ‘Keep it simple, Stupid’ is their matra as they slice away the aesthetics. Pure Designers: Throwing functionality out the door in favor of ‘cool’ designs. Pure Functionalists: These people generally are the hard coders and project managers. ‘Keep it simple, Stupid’ is their mantra as they slice away the aesthetics. great article, now “I” need to realign something… in my pants! heh. Thom – I didn’t code the existing March of Dimes homepage, nor will I be coding the new one. They’re opting to take care of that in-house. I’ll nudge them regarding your concerns. Thank’s for the article, it’s alway good to get a reminder of what it is we’re supposed to be doing! bq. The trick is to combine the two. I think that most webdesigners need to wear a lot of hats when meeting with and working for clients. And most of the clients cannot or do not want to communicate their goals. Wont give you time to do user research and only think of webdesigners as graphical designers. If a webdesinger needs to realign, he is wearing the IA(Information Architecture) hat. I think it is strange the author doesn’t mention IA. Because the items in the conclusion are part of the IA process, that is what Information Architects do in a webdesign project. Good article, but I don’t think we need another buzzword. I have been thinking along the same lines. If you pay attention to site feedback, usability test results, stats and market trends, the site will evolve as you go. Although I do think it’s okay to redesign a site that is about design or for an agency. I am a general reader of your articles but this one misses the mark by a mile in my honest opinion. My skills as do most evolve all the time, there are no_perfect_ designers out there, all good designers but none that are no _perfect_. Everyone’s evolve. Once my skills evolve I can rip apart my last design: the colour, the spacing, the logo, the layout, the typography and so on. Once I (please save me from yet another buzzword) _realign_, i’ve basically redesigned. I do however feel that there should be some branding unanimity in the deign true, but I don’t feel that you should criticise designers for wanting a redesign. As said, you made this seem exclusive and when it comes to designers, a redesign is much needed for attracting clients. Both as a fresh design and a showcase of new skills. I think you should have maybe clarified that up if you do beleive them to be simple. Realigning seems like patching(_no not that other new buzzword_ ). We all know what happens when something gets fixed and fixed and fixed and fixed and fixed, it breaks or it ends up looking like a mess (Damn, how I should have thought up a cooking metaphor). Realigning can only fix so much of the dislike or feel for change of a site. As I said and strongly beleive: *It’s in our nature as designers to want to redesign and thats the best remedy for the want*. It is a combination of TypoGraPhics, alignment and beautful imagery. A redesign may never needed to occur for the coming 10 years. “Purpose-driven” is a the key phrase in your article. All marketing needs goals. Without well-stated, measurable goals, we argue about whether marketing is “good,” when “good” is not the point; marketing is meant to be “useful.” To perform one or more specific, business tasks. “Good” is an adjective that should be reserved for how we feel about the quality of films, music and bean-dip. So… changes made to the creative of a Web site, brochure, etc. should always be purpose-driven. If those purposes related to the design; great. Sometimes design needs change based on real design issues. Tastes change. Headlines, messages, images, spokespeople, characters and gags go stale. I don’t accept the premise that a redesign in-and-of-itself is purposeless. There are good reasons, good purposes, for redesign. But they need to be clearly stated and understood; they need to be set as goals. Now… if you are working at an agency, your goal may be to milk your client for a few (hundred) grand in redesign costs. And to do that, you may need to yakkity-yak about various redesign needs that aren’t really real. But that’s a quibble over whose goals you’re managing to, isn’t it? I enjoyed reading this article. The funny thing for me is that, as I was reading, I realized that this is exactly what I just did. Two days ago, I finished working on a site for a client. The layout wasn’t drastically different; those used to visiting the site in the past wouldn’t have to learn a whole new navigation system; the changes were made to gear things toward a slightly different audience; the site was designed to be more useful to those visiting. And as I was designing the site, I was thinking about these issues and there was a part of me that I had to resist, a part that wanted to completely change the layout, color scheme, navigation. This is a good reminder to feel comfortable in making significant changes to a site that are not necessarily shocking. Folks will notice that things are different if the site has been altered to make the experience more rewarding. While it may be in the nature of designers to want to redesign (redesign for the sake of redesign? not sure I agree with you, Zach), sites should be created for the user, not the designer. While a desire may exist to move navigation from the left sidebar to a horizontal position at the top of the page, consideration must be given to why that design change would take place. Is it to make things easier for the visitors or just to satisfy some itch or to allow for more room in the sidebar or some other reason? If changes are being made, they should be made for a reason. If it’s just a change based on a whim, don’t do it. I think this idea of realigning is the same thing as redesigning a site, but the term redesign implies a total overhaul; it’s a matter of connotation vs. denotation. I don’t consider changing the color of links a redesign. I think this article was right on the mark, actually. Redesign sounds far more grand than changing from Arial to Verdana. Realign means that you changed to Verdana in order to achieve something to make your site better for those using it. Websites design should slowly evolve while they grow. However you get to a point where the content is too much and you need to radically re-think the navigation. Testing and prototyping often gets overlooked due to budget and time constraints”¦ unless you work for real good company. I love this articule its like the explanation to why web designers need to think like communications designers. Relying on the brief system, ( which for all intents and purposes is exactly the way a realigner would think: Problem, solution, audience, market change, and means. ) A do think a realigner and a redesigner can merge though sometimes for the best but in all intents and purposes. A good realignment keeps a brand intact and makes the layout more intuitive. For the past 4 years I studied Communications Design at Syracuse University, where we relied on the Brief. And I definitely think webdesign is the one of the more recent mediums to gradually become more strategic. Synapse has been the key for years, quick response, blinking crap. pop-ups. Major brands that care so little about their web presence they dont actually realize it does harm to their viewer’s opinions of said brands. I graduated last May and always I turned away from web design as a practice because most clients kept pushing for just a redesign. I think the idea is out there now to push to the next level of web design and convince future client’s for more strategic solutions, its a tough sell and alot of clients for web especially may not have the budget for a solidified research and marketing phase of their said project but like you have shown the said project may mean not to reinvent the wheel. Ps I think the march of dimes site is a great example of this. so are newspaper and magazine websites. check those out as well they change gradually to their audience and market. But I will say most websites that get into this habit tend to get dull, so their is always a balance to it all. How many times will an average person look at cnn.com’s if the said website doesn’t get redesigned. It’s a great question to ask, I find everyone gets bored at some point and that being said the risk to screwing up a site that large and losing the said viewer because they got turned off by the new layout or typographic changes are that much greater. Just some thoughts I’d share. Your view of iLife really opened my eyes to subtlety of design. I knew the packaging changed, but not enough to warrant a new campaign (like when apple switched from their rainbow colored apple to the solid color one). yet it really does evoke a paradigm shift for the consumer. Here’s a great link to another site dedicated to design realignment. I thought you might find it interesting. Thank you for this article. I found it informative and thought-provoking. Redesign: We’ve had our site for three years now and I see alot of our competitors completely change their site lately. Let’s do the same. Realign: Our unique visits and on-line sales have steadily declined over the last two years when the market trends suggest more on-line purchases from our customer base. Let’s look at our analytics and survey some of our clients. Then we can talk about how to proceed. I understood redesigning to mean an emotional reason to act as opposed to realigning which is an analytical one. Given that “redesign” is used in some many aspects of the creative industries, maybe another term could be used. I also feel that Cameron’s examples were very effective demonstrations of his point but seemed to be focused primarily on websites. With the dramatic increase of e-mail as a viable marketing tool, I would like to see his realigning techniques applied to e-mail design. I like this topic, really. Intresting and make some sense. But like Leo Pitt said, if talk about “Re-Develope” a little, will be better.